Look better and feel great in just nine days with this expertly-devised cleansing plan. Designed to kick-start the F.I.T. 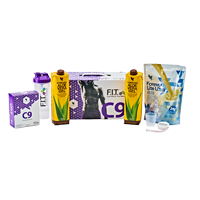 programme, cleanse your body and adjust your mindset, C9 provides the perfect starting point for transforming your diet and fitness habits. Based around Forever’s bestselling Forever Aloe Vera Gel, this nutritionally-balanced programme will allow you to see real results in just nine days. N.B. For comprehensive instructions use the step-by-step C9 booklet provided in this pack. For the complete list of contents and ingredients please click here. PLEASE NOTE: This is the official selling site of the C9, where we offer a 60 day money back guarantee. Any C9 bought on a third party website may be counterfeit or out of date.